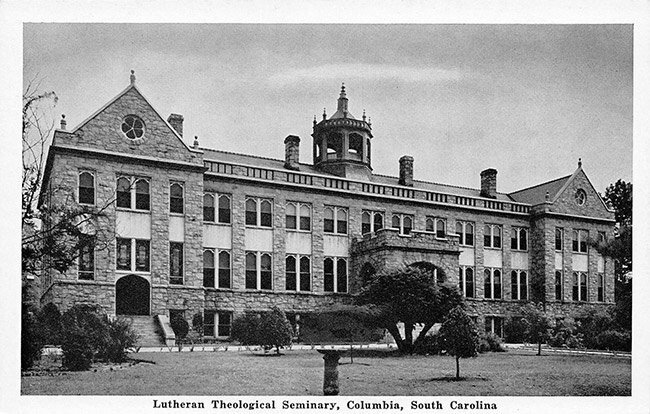 The Lutheran Theological Southern Seminary in Columbia is the nation’s second oldest Lutheran seminary. It is one of eight seminaries serving students of the Evangelical Lutheran Church in America. It dates to 1830 when it was founded in Pomaria at the behest of the Reverend John Bachman. Bachman was a close friend of ornithologist John James Audubon, and in 1832 the Reverend discovered a bird that was subsequently named for him, the Bachman’s warbler, believed now to be extinct. The seminary’s first graduating class of 1834 consisted of one student, Frederick Harris. Near that time, the seminary relocated to Lexington, marking the first of many moves. In Lexington, seminarians met for classes at Corley Hall Plantation and boarded both there and at the John Fox House. After her husband Emmanuel’s death, in 1838, Catherine Meetze Corley deeded the home and 102 acres of surrounding land to the Lutheran Theological Seminary. This arrangement lasted roughly 20 years, with various sources stating it ended in 1855, 1856, and 1858. In 1860, Corley Hall was purchased by the Reverand William Berly, who had been one of the first three graduates of the seminary after it moved from its first home in Pomaria. Today this home is also known as the Berly House. Its new owner operated a school for girls just north of his home until he died in 1871. The South Carolina Lutheran Synod agreed to establish a four-year college affiliated with the seminary near the school’s original location. The seminary then returned to Newberry County, and Newberry College was founded. However, at the onset of the Civil War, the school closed as faculty and all three of its students were called into service and Union troops occupied the school building. Facing economic devastation after the war, the college and seminary moved to St. John’s Lutheran Church in Walhalla before briefly moving to Columbia in 1871 and Virginia in 1872. 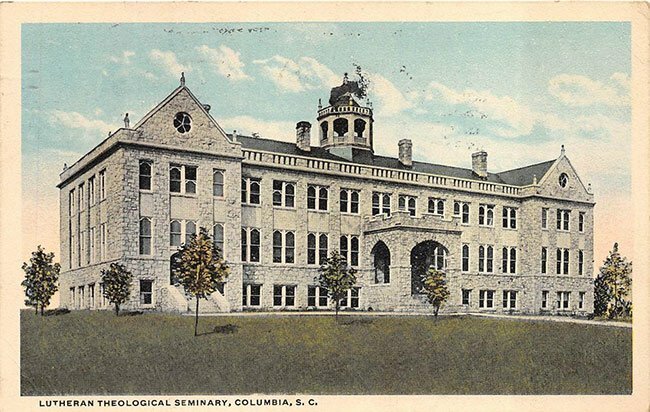 After the college moved back to Newberry in 1877, the seminary closed until 1884. It then reopened at Newberry College before separating from the college and moving to the present-day Darby Building in Mount Pleasant in 1898. The seminary remained in Mt. Pleasant until 1911 when this three-story granite building was erected on the highest point in Columbia, now known as Seminary Ridge. Called Beam Hall, the building originally housed a dormitory, library, classrooms, and a chapel. Since then, new buildings have been added to the 17-acre campus, and in 2012 the school merged with Lenoir-Rhyne University, a four-year Lutheran-affiliated school in Hickory, North Carolina. The seminary also operates a campus in Asheville, North Carolina. The theological school offers programs in other denominations as well as nondenominational programs. 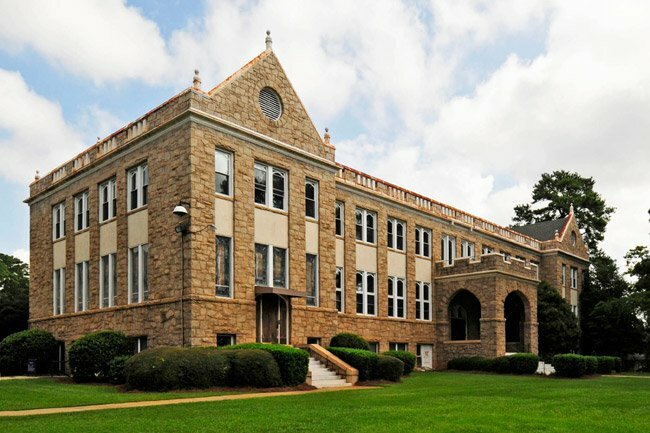 Designed by architect Charles M. Robinson, and with Wise Granite Co. as contractors, Beam Dormitory was built in 1911 as the first building at the Columbia location of the Lutheran Theological Southern Seminary Campus. Since its construction, the Seminary has played an important part in the religious and educational history of Columbia and has made the city a major center for the Lutheran Church. 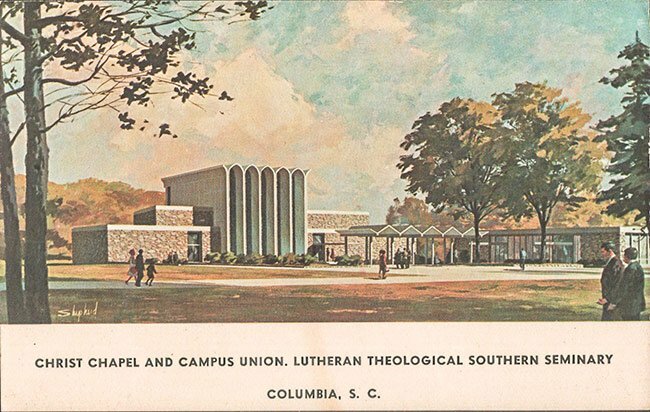 The Lutheran Seminary had its inception in 1830 and subsequently went through a variety of locations until a decision was made to construct a permanent campus in Columbia. Beam Dormitory was the first structure to be constructed at the Columbia location and was designed for use as classrooms, dormitory, library and chapel. Constructed of granite with a gable roof, the three-story Gothic Revival Beam Dormitory features a central recessed rectangular core with projecting end pavilions. Central castellated entrance pavilions are located on both the front and rear facades. These pavilions feature front and side arches and are surmounted by a flat roof with crenellated parapets. Changes in the original structure include removal of a wooden octagonal cupola in the 1950s, replacement of the end pavilion gable oculi glass with wooden louvers; replacement of the original slate roof with composition shingles in the 1940s, and the dismantling of chimney stacks when central heat replace the old furnace in the 1950s. This is great info, Mr. Fennell! We appreciate it, and we’ll work on adding it today. Thank you! As far as I know the Seminary never used the courthouse but the Berly House (Corley House) was used as a lecture hall. There was another structure that was built for the Seminary while in Lexington but it no longer exists. Hello again, Mr. Fennell! Thank you for this helpful info also. Do you know if classes were held in the courthouse or at Corley Hall Plantation? We’ll research this too, but we currently have it listed both ways and know you are an expert on Lexington history! Despite what the National Register nomination form says, the John Fox House was never a part of the Lutheran Seminary. It was probably built by Jesse Bates around 1832 then bought by John Fox in 1843. The Ernest Hazelius House on the grounds of the Lexington County Museum was a part of the Lutheran Seminary while it was in Lexington though. I am seeking a photo (s) of Henry Rauch, son of Michael Rauch, who was one of the first Lutheran pastors in the “Dutch Fork” area in Lexington, Columbia, SC. Henry attended the Lutheran Seminary prior to the War Between the States and was killed at Gettysburg in 1863.